Fiji National football coach, Christopher Gamel with team at Fiji FA ground on May 02, 2017. Photo: Ronald Kumar. The Vodafone Fijian football side is aware of the task on hand when they face the European side Estonia in an international friendly match this Sunday. 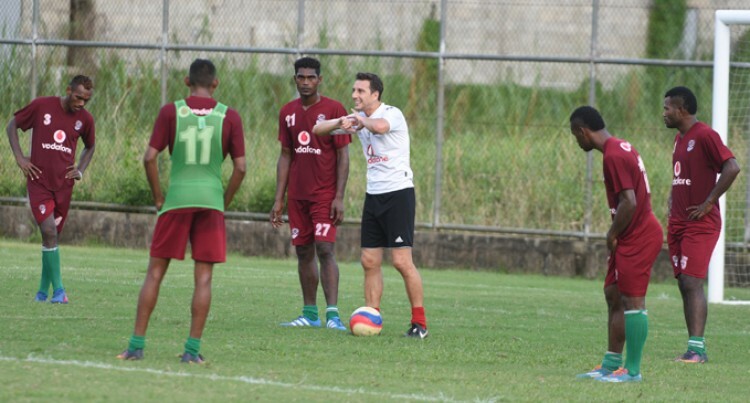 The Christophe Gamel coached side has had its ups and downs in camp, but the side is confident of doing its best and gaining good exposure against the world 80th ranked team. It has been quite long since Fiji played a top 100th ranked team and the Bula Boys are raring to go. Gamel will name his 23-member squad tomorrow while the visitors is expected to arrive earlier the same day. The visitors came to Fiji fresh off a 3-nil win in Malta. Estonia will play three matches in Oceania with Fiji being its first challenge. The side will then travel to play against Vanuatu and New Caledonia later this month. The completion of its matches in Oceania will see Estonia play five international matches in November. The match kicks off at 3pm at Suva’s ANZ Stadium on Sunday. Meanwhile, ticket sales of match continue from the Fiji Sports Council Office in Laucala and Post Fiji Outlets around the country. Tickets are selling at $15 for Adults on the grandstand while children will pay $7. Adults can buy embankment ticket for $10 while it will be $5 for children.